The crew was out in the middle of the night on Overland Ave. in West L.A., installing this five-story “inflatable” supergraphic sign that’s part of a $100 milllion-plus advertising campaign signaling McDonalds’ foray into the upscale coffee market dominated by Starbucks and a handful of other chains. 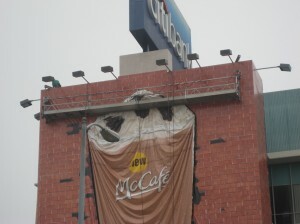 The building previously sported a supergraphic ad for designer jeans, which wasn’t removed, but covered up by the faux brick of the McCafe sign. Last year, the company that installed the ads, World Wide Rush, got an injunction from a U.S. District Court Judge barring the city from enforcing its ban on supergraphic ads at the location. 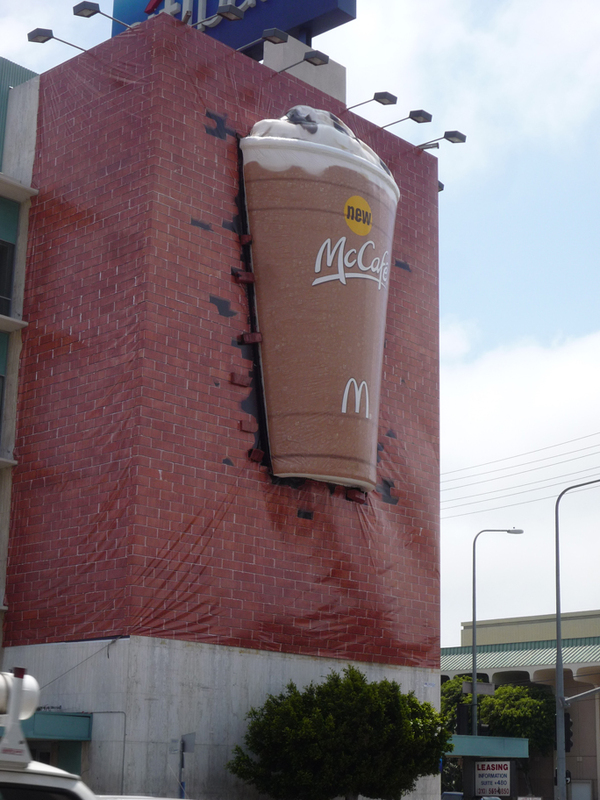 According to an advertising industry publication, McDonalds spent $825 million last year on advertising on TV, radio, the internet and billboards and other outdoor advertising venues. 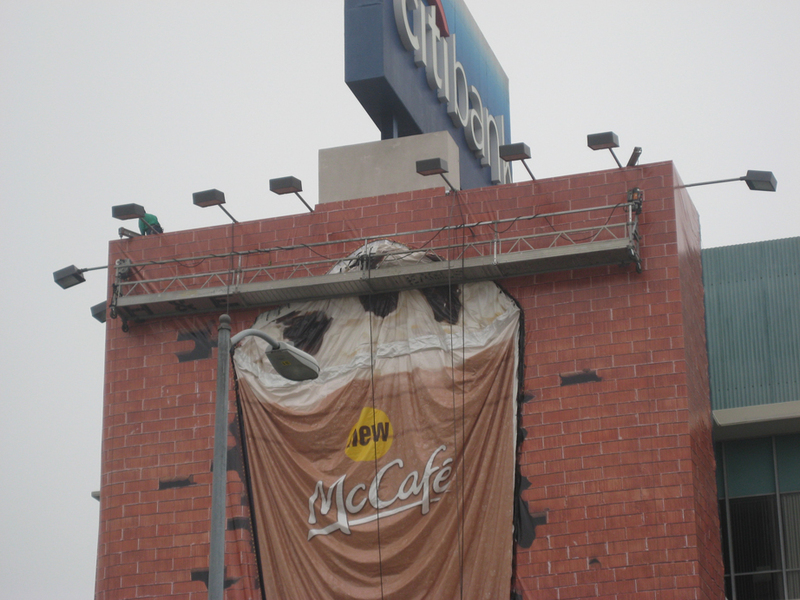 To tell McDonalds (for whatever its worth) what you think of their marketing campaign, click here. This sign was installed in broad daylight at about 3:30 p.m. The sign is legal and protected by a Federal Court injunction. The City cannot continue to play favorites and give permits only to favored developers while denying the same rights to all others. While you may not like signs, calling this illegal or claiming it was installed secretly in the middle of the night is not true. Your claim that the sign was installed in broad daylight is rendered absurd by the photo above that was taken in the middle of the night. 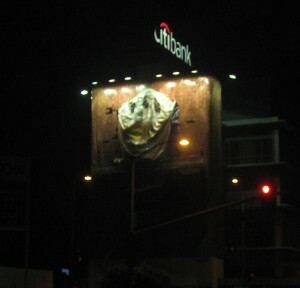 And there are witnesses who would testify under oath that they saw this installation taking place. In addition, the department of Building and Safety issued an order requiring the owners to provide verification that the inflatable sign complies with method of construction/connection standards, wind loads, etc. The owners failed to comply with that order, and the case has been submitted to the City Attorney’s office for further enforcement. I’m sure you’re aware of the fact that the federal court injunction you refer to only enjoins the city from prohibiting such signs under the off-site sign ban, but explicity states that the city may enforce other regulations regarding materials, methods of attachment, etc. that are intended for the protection of occupants of the buildings and motorists and pedestrians on the nearby street.